Citrus is native to Southeast Asia and was introduced to the Americas by Spanish travelers. The world’s leading producers of citrus are Brazil, China, and North America. Here, the leading states are Florida, California, Arizona, and Texas. Citrus fruits don’t always turn color when ripe. Most turn color based on temperature. The best way to tell when a fruit is ripe is the “squeeze” test. Give a fruit a gentle squeeze and, if it is ripe, it will have a little give to it. A lot of the bright orange and/or yellow citrus we see in the grocery stores have been dyed. To avoid dyes, either buy organic or buy California oranges, since they ban the use of artificial dyes. Or you can grow your own! Pick a window that gets six or more hours of direct sunlight. An unobstructed south window is best. By unobstructed, I mean no sheer curtains, blinds, tinted glass or overhang, and no trees outside. I grow mine in a southeast window—direct sun from sunrise until about two-thirty in the winter. They do okay. Because winter sun is weak and days are short, during long cloudy stretches, I supplement with a grow light left on 16 hours a day. Once you’re sure you’ve got the light. choose your tree. I look for a sturdy stem with several branches and fresh new leaves. I don’t care if it already has flower buds on it or not. The shock of moving it home may make these fall off anyway. Humidity is important. If you have a lot of houseplants, then that alone will raise your indoor humidity some. If not, then a daily light misting will help. Remember, the purpose of misting is to ‘fog’ not ‘rain.’ If you mist so heavily that it drips all over the floor, that’s raining. I mist lightly—up in the air over the top of the plant so that tiny droplets just settle on the foliage. Fertilize three times over the season—once in late winter, once at the beginning of summer, once in late summer. One way to remember this would be Valentine’s Day, Memorial Day, and Labor Day. I use Espoma Organic’s Citrus-tone. Citrus fertilizers usually contain a little more nitrogen, because citrus seems to need a heavier dose. They also need magnesium, so a good citrus formula should contain this, as well. Citrus often bloom in the winter. When they do, you’ll want to step in and pollinate the flowers yourself. I use a small watercolor-style paintbrush for this. I simply dab it gently in the middle of the flower and wiggle it around, then move to the next flower. A couple of other things to keep in mind: When possible, move citrus trees outside for the summer. Wait until the first week of May. When you move your tree outside, place it under a tree in dappled sun before moving it to full sun. Bring it in when night temperatures are falling just below 40 in the fall. In the fall, you can help avoid shock by moving it back into dappled sun for a couple of weeks before moving it back inside. Inside for the winter, water trees when the soil is dry a finger-length down, but do not let the plant go so dry that the leaves curl or droop. While it is outside for the summer, water whenever the very top of the soil is dry to the touch. Hot summer sun and breezes can make them dry out faster. We just got in a shipment of gorgeous citrus trees. Come in and let us help you select a little “sunshine” for your window. 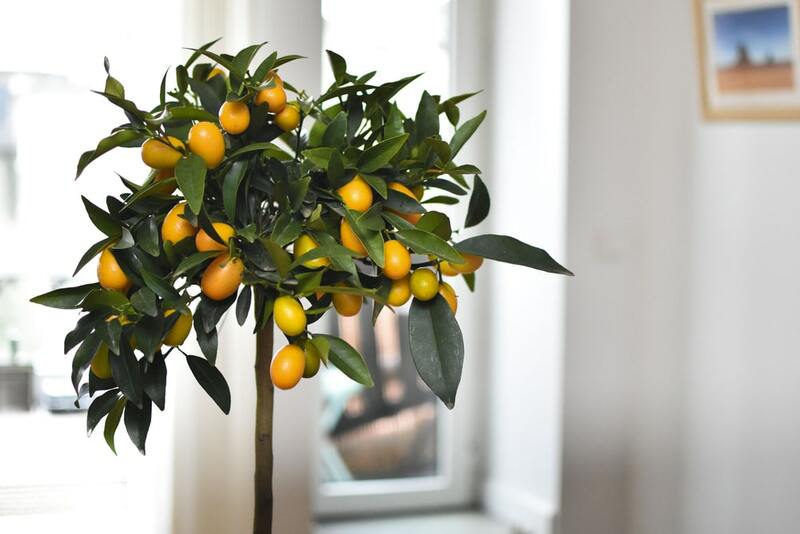 Do you sell Meyer lemon trees? Suzanne, we do sell Meyer lemons, Key limes, kumquats, etc. We have a great selection right now!